The US Optimist Dinghy Association does a great job of promoting youth sailing and getting kids excited about the sport. As a proud sponsor, we love to highlight these young racers and follow them as they grow! In this spotlight, meet nine-year-old Ella Demand, who is following in her parents' footsteps. Both of Ella's parents grew up sailing at Toms River Yacht Club in New Jersey. Two years ago, Ella started sailing there too. Still relatively young and new to the sport, she’s already hooked and enjoying the people as much as the sport. Here is what she had to say about her new passion. Both of your parents are sailors, but why did you decide to try it? I saw some pictures in a magazine, and they were hiking really hard. It looked like something I wanted to try. How have your parents helped you improve your sailing? My mom and dad tell me what I did wrong, then I can fix it. I also have a coach that changes every year. Right now it’s my dad. What’s your favorite part of having your dad as a coach? He’s always right there next to me. How about your mom? How has she helped? She tells me that even if you’re scared, you still go out. At one race, it was 10-15 knots in the morning, but heading out after lunch a big gust of wind came in and flipped all the boats on land. They’d just pushed me off the dock, but right after the big gust of wind, my coach quickly dragged me in. My cousin helped calm me down (he’s thirteen, and he sails sunfish). What’s your favorite thing about sailing and racing? Meeting new friends. There are two people who went to my school, and I didn’t know them until we started sailing. During races I can maybe run into people I saw around the club but never got to meet them. I can meet them at the races. When I’m racing, my favorite is point races. I like downwind the best because you lean the other way, and if you pull too hard you could go in the water. Have you ever gone in the water? What did you do? Once I fell in. I had to go get my boat because it started to sail away from me. I was sort of scared, but it’s happened to my friends before, and they told me what it was like. If you could sail anywhere in the world, where would you go? Why? Lake Garda, Italy. My dad sailed there, and he said there are always great wind conditions there. To place in every regatta I go to. Good. I placed first at Interclub, second at the TRYC No Tears Regatta, second at Powderpuff, and second at the Back-to-school Regatta. That was my favorite because all my friends were there. Besides sailing, what are your other activities? Swimming. This is my fourth year on the team at the YMCA. What advice would you like to share with new sailors? Don’t be scared, because your coach is always right beside you. Ella currently sails with a Quantum XR-1 Green. 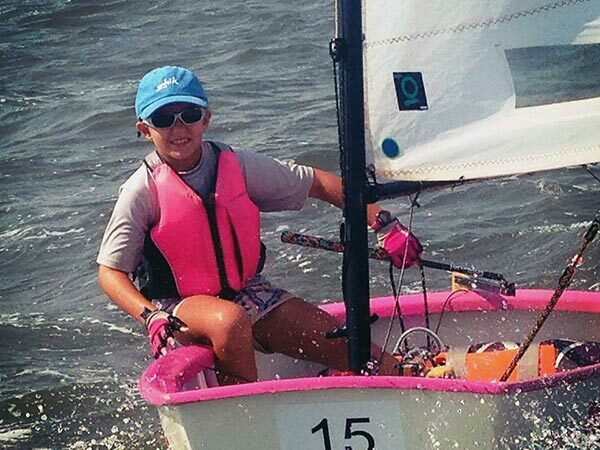 Her dad said they chose that sail because it’s more forgiving to trim for sailors with moderate experience, and it’s designed with a flatter entry to accommodate sailors that are on the smaller side, like Ella.